To the astute, long-term rock ‘n’ roll fan, a band like Greta Van Fleet is something of a godsend. Not only is this an impossibly young band channeling the sounds of blues rock and hard rock of days long past, but they’re having some noteworthy success with it. Just look at their debut single Highway Tune, which topped Billboard’s Mainstream Rock and Active Rock charts and solidified Greta Van Fleet as – for now, at least – the newest act to spearhead the charge of modern classic rock bands. But the main reason that older listeners especially will find favour with this band is because they sound exactly like Led Zeppelin. That’s not even a remotely facetious statement either; there isn’t a single element of this band that doesn’t sound like Led Zeppelin, and on From The Fires (which sees the four tracks from their Black Smoke Rising EP bundled in with four new ones), they want to make that as abundantly clear as possible. It says a lot that a track called Flower Power driven by jangling guitars and replete with ’60s imagery is included here, and only serves to further establish that there’s nothing contemporary about Greta Van Fleet whatsoever. But at the end of the day, everything about From The Fires ultimately circles back around to Led Zeppelin, whether that’s Jake Kiszka’s hairy-chested blues rock riffs or Josh Kiszka’s spot-on Robert Plant impression that acts as the album’s rock-solid centerpiece. And credit must be given here, as compared to so many other revival-rock bands, Greta Van Fleet actually seem like they know what they’re doing. The aforementioned Highway Tune is the sort of uncomplicated throwback that earns its stock through driving riffs and grooves above anything else, and as an opener, Safari Song condenses all of their howling, flagrantly retro skill into one manageable package. But for the most part, that’s all relative. Greta Van Fleet may be able to rise above their peers as far as this sound goes, but considering some of the other examples on offer, that isn’t difficult. In a wider context, this is an almost shameless example of mercenary sonic tailoring that is aiming directly at a specific audience by feeding them what they want and what they’ve heard before. The fact that there’s a cover of Sam Cooke’s A Change Is Gonna Come shouldn’t really come as a surprise with regards to this; it may be a track that Kiszka’s oversized wail can fit into, but it’s ultimately the sort of safe staple that would produce successful results more times than not. That’s pretty much where From The Fires lands as a whole, in that it’s a mostly safe listen that doesn’t even attempt to step out of its comfort zone. And for a release that’s only eight tracks long, that can lead to a disappointing amount of flab, particularly on tracks like Meet On The Ledge and Talk On The Street that not only feel like Greta Van Fleet are recycling from Led Zeppelin, but from themselves as well. It makes From The Fires feel as though it offers even less than it already does, and while it does manage to keep something of a stable foothold when place next to other bands of this ilk, it’s unlikely that Greta Van Fleet will be changing the game if they continue like this. Even as a retro-rock band there’s no discernible identity, and even if some of that is negated by a more technically proficient sound, it’s not an album with much in the way of depth or layers to be explored. For those classic rock fans still yearning for the past, Greta Van Fleet are a passable conduit between then and now, but if a lot of this sounds familiar in any way, it’s probably because you’ve heard it all before. 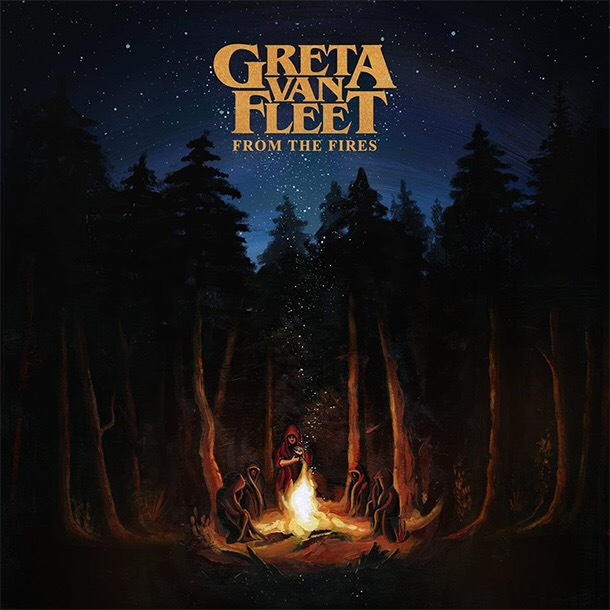 ‘From The Fires’ by Greta Van Fleet is out now on Republic Records.